Who would have thought that the same practical man from Philadelphia, who helped found the United States of America in 1776, would also make so many important contributions to fire prevention and safety during Colonial America? Such contributions would include (i) writing frequently on fire prevention, (ii) founding the first volunteer fire company in 1736 called Union Fire Company, and (iii) organizing the first fire insurance company in 1752, named the Philadelphia Contribution-ship for the Insurance of Houses from Loss by Fire. But it's true, Benjamin Franklin did all these things, and many more. He also invented the lighting rod in 1753 to protect houses from burning down and people from electrocution due to the destructive forces of lightning. He also invented the Franklin Stove in 1741 to reduce the risk of fire to houses from sparks and cinders from conventional fireplaces. Ben Franklin believed it preventing problems before they happened. In doing so, he is famous for saying to fire-threatened Philadelphians in 1736: "An ounce of prevention is worth more than a pound of cure." Clearly, preventing fires is better than fighting them, but to what extent can we protect ourselves from fires, many ask? All of a sudden M-Fire's Patent Attorney introduces the similarity between what we are doing at M-Fire Suppression, to what Ben Franklin did back when. Now we feel a close connection to Ben in many ways, especially for his deep desire and great work and institutions to protect people and property from loss by fire. Ben Franklin's spirit of brotherly love motivates us to develop and deliver the best possible ways and means for protecting raw lumber buildings during construction on the job sites. During the construction phase of wood stick framed and mass timber buildings -- despite negative attention we may receive from those who are not haunted by Ben Franklin's Spirit of Invention to push forward, make technological progress in the field of fire prevention and building and construction safety, and just make the world a better place. Believing Ben Franklin that "An ounce of prevention is worth more than a pound of cure", we were inspired to invent and develop M-Fire's patent-pending Mighty Fire Breaker™ Job Site Fire Protection Site Spray Services which we are now delivering to many of our nation's largest high-density housing and apartment builders, to provide the safety their construction workers and neighbors require during the construction phase of each wood-framed building, and reduced risk building owners and insurance carriers demand in the public interest. 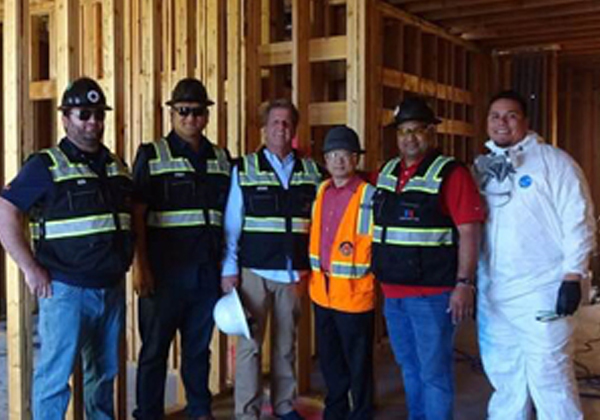 By treating all exposed wood on the interior of a wood-framed building during the construction site, M-Fire's Mighty Fire Breaker™ Job Site Spray Service is able to reduce the ignition of fire, smoke that may develop, and free-radical gases that may be generated, and either prevent or at least significantly delay fire "flashover", to provide an unprecedented level of reduction in risk during a fire outbreak on a job-sites whether by accident, or through intentional acts of destruction by arson. We hope Ben Franklin would approve of what M-Fire is doing today as we follow his principles of fire prevention and labor to advance safer and better best practices in the wood-framed and mass timber building industries. We do so keeping close in mind what Ben Franklin understood very well back in 1752, that future fire insurance companies would need to play an important role in fire prevention, including setting higher standards and requiring better practices as advances in applied science would enable, to reduce and prevent fire risks, as these companies continue to underwrite new construction and building insurance policies against loss by fire. Only by playing a high-standards setting role we can we expect fire insurance companies to survive and prosper long into the future, as did Ben Franklin's Philadelphia Contribution-ship Fire Insurance Company, some 265 years later, from its founding back in 1752.